Imagine that you are on a beautiful Brazilian beach, lounging under a softly swaying palm tree, completely relaxed, yet hungry for breakfast. Or imagine that you have just finished an extra hard workout at the gym and you are simultaneously hot, sweaty, and weak with hunger. What is the perfect breakfast for both of these scenarios? A Brazilian açaí breakfast bowl, of course! Açaí (pronounced a-sa-EE) are nutritious berries that grow on a species of palm in Central and South America. They have a bright, sweet flavor and are a very deep purple in color. One of the best ways to enjoy acai is to eat them as a frozen puree, almost like sorbet, topped with fresh fruit (typically bananas) and granola. This smoothie in a bowl - cold, sweet, tart, with crunch from the granola - will fill you up, cool you off, and may have all kinds of nutritional and health benefits as well, if the many claims about the health properties of the acai berry are true. 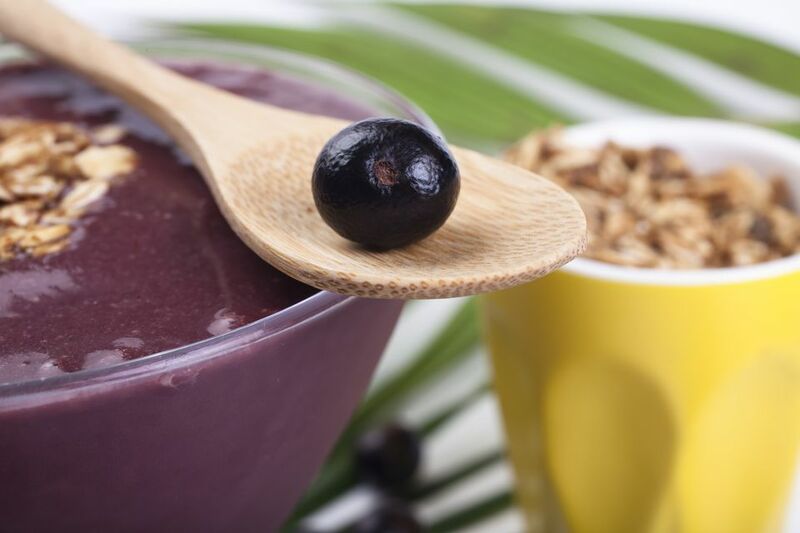 In Brazil, frozen açaí is often mixed with guarana (usually in the form of syrup - xarope de guarana), a fruit from the Amazon that is also thought to have many health benefits and which contains caffeine as well. Some people add other ingredients to their acai bowls such as milk, sugar, orange juice or pineapple. I like to add frozen passionfruit puree for its tartness. Read more about the famous açaí breakfast bowl here. Place the frozen açaí and the passion fruit purée in a blender, along with one banana, the orange juice (if using), and the sugar. Blend until smooth and thick. The mixture should have the texture of a soft sorbet that you would eat with a spoon. Taste and add more sugar if desired, or a bit of lime juice for extra tartness. Place the fruit mixture in a bowl. Slice the remaining banana and place the slices on top of the acai. Sprinkle granola over the fruit.